The new and improved Snap N Go EX Universal Infant Car Seat Carrier, will accept one infant car seat. It allows adults to place an infant car seat on the carriage frame without removing child from the infant car seat. A convenient 2 cup holder parent tray with covered storage compartment makes this stroller easy for travel. 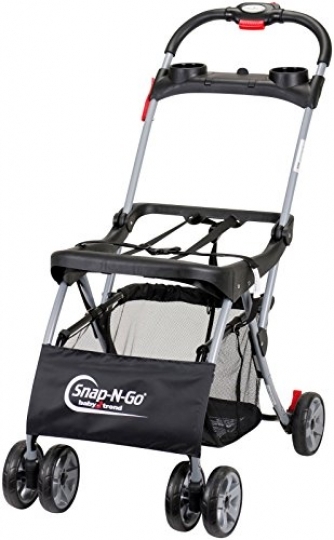 Lightweight and easy to transport the Snap N Go EX features a convenient one hand fold. For parents on the go, this stroller includes a large drop down storage basket to keep your necessities close by. Safety features includes rear wheels with brakes for stability, adjustment straps on the carriage frame to cradle the car seat, and the securing strap for securing the car seat onto the carriage frame. Accepts all Baby Trend and accepts Most: • Chicco Key Fit 30 • Combi Shuttle 33 • Cosco • Evenflo Embrace • Graco Snugride 22 and 35,& Safe Seat 32, • Maxi-Cosi Mico• Peg Perego Primo Viaggio 30• Safety 1st on Board 35… and more Infant Car Seats.